Have you ever seen something online and knew you had to have it? The first time I saw a Midori Traveler’s Notebook my heart skipped a beat. There is something very exotic and desirable about Japanese stationery, especially expensive unavailable Japanese stationery. I did a little poking around and couldn’t find any retailers stateside. I did find an abundance of photos to enjoy over on Flickr; there are even groups dedicated to the Midori Traveler’s Notebook. If I couldn’t have one, I’d live vicariously through people who could. Andrew from Maido contacted me and asked if I might like to review some products. I jumped at the chance, literally bounced around for an embarrassing minute or two. When the first mystery package arrived, I didn’t know what to expect. 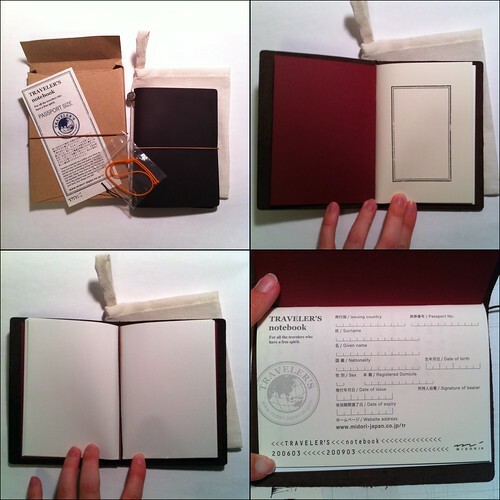 Behold – The Midori Traveler’s Notebook in convenient Passport Size. How did he know?? The notebook is packaged very well. It arrived inside a plastic envelope, cardboard box, and a protective cotton slip case. There is a spare elastic which I’ve read can be used to hack the Midori to hold extra refills. I’m not sure whether or not I’ll be altering this beauty. The notebook cover is leather. One elastic band wraps around the middle and holds it shut while the other runs the length of the spine and holds the insert. There is a thin bookmark which locks into place by fitting into a notch in the leather at the bottom of the spine. Goodness this thing is beautiful. My first thought went to the refills. If I can find something on-hand or DIY it, I will. 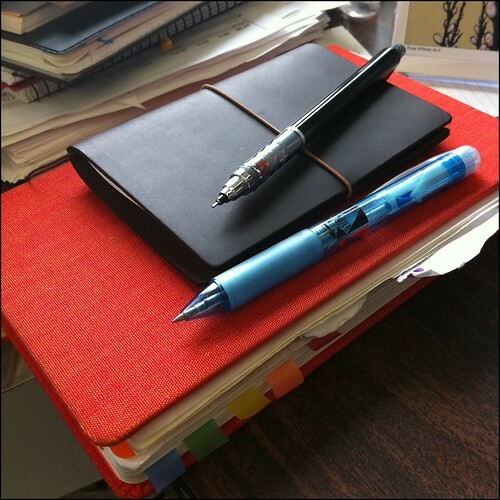 I grabbed a Moleskine cahier and a Doane Paper utility sized notebook from my notebook stash. No dice. These pocket notebooks run 3.5 inches by 5.5 inches. The Midori passport refill size is 9cm (3.5 inches) by 12cm (4.7 inches). I do have one small notebook that will work. It’s not a standard one and I received it as a gift. (It’s the printed one on the right in the above photo). If you recognize it, please contact me so I can share the details on where to find them. Until I find a source for notebooks this size, I will be making my own. Refills won’t need to be perfect either – I can probably whip several together quickly because imperfections will be hidden by the gorgeous leather cover. The notebook comes with a plain refill containing “80 perforated pages of blank paper.” This paper is rather thin. I grabbed a nice pile of black pens from my arsenal and made a test page in the back of the refill. There was minimal bleed-through but the show-through might be a deterrent for writing on both faces of the pages. I’ve been thinking I might use a pencil or a 0.4 gel pen. Graph, lined, calendars and “Blank MD Paper” refill options are all available. The Blank MD refill states “Has an excellent writing surface with absolutely no bleeding or feathering at all. Comes with 64 pages.” I might have to give it a try. 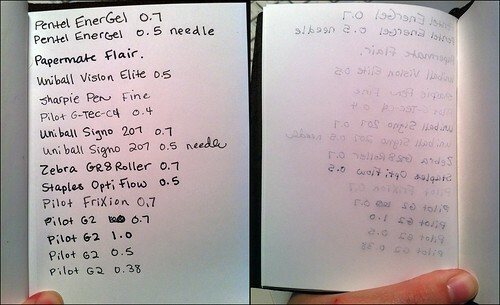 Thicker paper should stand up better to all of these pens and maybe even a fountain pen. It would be fun to test out. I haven’t decided what I’ll be using this beauty for yet. It seems like I should have a special purpose for it. I know the leather will only look better with more use so it may just become a daily holder of lists. For now I carry it around and pet it. My Uni-Ball Kuru Toga seems to like it too. I want to thank Andrew from mymaido.com for sending this dream-come-true to me. I hope you enjoyed this peak at the Midori Traveler’s Notebook. Take care and be well. ADDENDUM: The amazing Carina of Crow & Canary fame let me know that the small notebook is a Scout Book. The size is 3.5 inches by 5 inches. I just retested it in the Midori cover and it looks fab! Awesome! You got it, it’s a Scout Book! 100% recycled paper, printed in vegetable inks. Thanks for including us in your round-up. 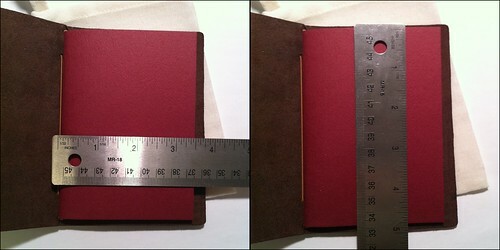 Check out more at http://www.scoutbooks.com. Hi! I’m new to your site via Carnival of Pen and Paper. Just wondering what kind of notebook the red one under the Midori notebook is? It looks very interesting with lots of stickies! There isn’t any identifying marks in it unfortunately. I picked it up on sale at Half Priced Books. Wish I knew what kind it was – the paper is good. You don’t need to alter the notebook in any way if you want to add more inserts with the extra elastic; just connect two inserts with the elastic tied in a loop as the ‘spine’, then put those underneath a third insert that’s in the original elastic. There are some pictures of the idea on Flickr, somewhere. 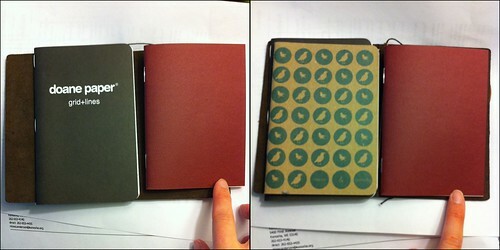 Apica makes a small notebook that fits the passport-sized Midori just perfectly, but I have only found a lined version.